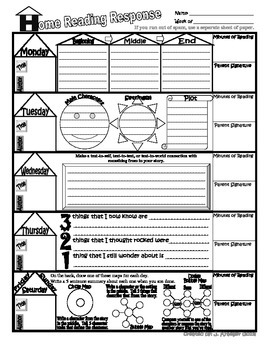 The first one is for summarizing or reflecting. I have used it for specific response questions that I wanted to have answered about a story. The second one is more specific. They have a different activity that has to be done for each day. This can be done with different books every day or if you are attempting to build fluency by having them read the same story every day. There is a different activity to complete for each day of the week. 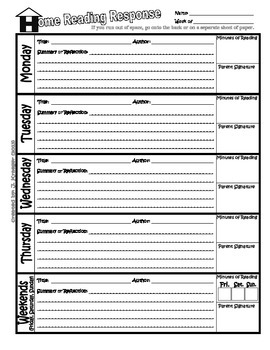 Each day includes the day of the week, a place for the title, author, time read, and parent signature.